What kind of person signs up for a cage fight? Aliyah, a mixed race Australian lives a solitary life as a computer specialist in London. She is born with an exceptional intelligence but her gifted mind does little to alleviate the pain she carries inside since her childhood. One day Aliyah stumbles upon a mixed martial arts gym. Like many fighters before her she finds peace in a sport that is seemingly violent. She takes on training with a military discipline as an easy substitute for any meaningful bond in her life. Her journey to her debut cage fight is challenging, but it does nothing to prepare her for the biggest fight of her life. 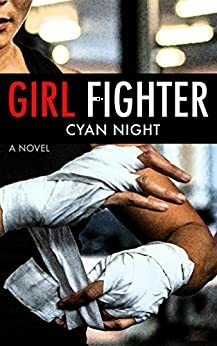 Girl Fighter explores the motivations of a mixed martial artist, the challenges of women in combat sport and the unseen struggles of a brain injury survivor. A fabulously exciting book, with real depth and emotional punch. This would be 5 stars with careful editing, and rates 4.5 in spite of the lack. It was a well explained tale of a strong woman’s path to a TBI and how it affected her. It enticed me to read research about the subject and its treatment. I highly value reading narrative from which something of value is conveyed. I would love to see a follow up showing the longer term life impact of TBI on Aliyah’s life and how she is coping with it. Thank you to the author. I wish her much success. 4.0 out of 5 starsGirl Fighter in 3-ish words: Memorable, Smart & Honest. Girl Fighter by Cyan Night is the story of Aliyah, a computer engineer turned cage fighter (so basically a woman in a man’s world x2). Girl Fighter is set in London, but Aliyah is from Australia with a Han Chinese father and a mom who was a Muslim from Kazakhstan. Aliyah loses her mom young and then is mostly raised by her grandparents as her father descends into alcoholism. Girl Fighter touches on stereotypes of many kinds, and my heart broke for Aliyah as the book went on. This was a super-fast read and I flew through the pages. I know nothing about MMA, cage fighting, Muay Thai, etc. but I found this book fascinating. Everything is explained with such great detail so that the reader can understand exactly what is going on at all points of the novel. While a lot of detail can be tedious in my opinion, it worked in this book as a reader knowing nothing about fighting. My only real issues with this book were that I found the writing to be a bit choppy at times, and there were times the POV would slip from Aliyah to another character in the middle of a paragraph and then back again. This may have been a conscious decision by Cyan Night, but I found it frustrating at times as I like my POV changes to be very clear and orderly. Other than those two things I was perfectly happy with this book. Final Thought: I think it is so cool that Night wrote about something she knows; if you read her author profile it sounds like she is an extremely interesting woman. She has extensive knowledge in martial arts, and she has traveled a ton. This is a debut novel and I would definitely be interested in reading whatever she writes next. Girl Fighter in 3-ish words: Memorable, Smart & Honest. Girl Fighter is an intense novel that takes the reader into the mind of a person suffering from the devastating affects of a traumatic brain injury. In this compelling story author Cyan Night cleverly displays how brain injuries not only affect the injured, but also how it can affect the people in their lives. Aliyah Jun has a successful career as a software engineer for PGC. As a self described loner her mother died when Aliyah was only two years old. Raised by her cold and distant father she never developed the ability to connect with people and often stayed to herself, alone in her apartment. On a whim, Aliyah decided to join a gym for MMA fighters. Preparing for the first professional fight of her career, she continues to struggle with her past and building relationships. Once the night of her first professional fight arrives, a series of events takes place that changes the course of Aliyah's life forever. Told in two parts, the author takes the reader on a journey that is both emotional and gripping. Night successfully captures the emotions of the book's main character Aliyah. Perhaps the most memorable aspect of the book, is the internal struggle Aliyah faces as she tries to cope with her own aggressive behavior. There were quite a few aspects of this book that I enjoyed. First, as the mother of a female fighter, l was able to appreciate each training session and fight scene described in the book. Nights descriptions were realistic and vivid, making it easy to visualize each moment. I could also appreciate the references and comparisons to the Ali vs Liston fight. I thought it was brilliant how the author used these fighters to convey her story. Next, I loved how Night subliminally incorporated the power of visualization within the story. Leaving me to wonder if the events in Aliyah's life were the result of self-fulfilling prophecies. Overall, I enjoyed this thought provoking novel. It is an engaging work of fiction that offers a intriguing glimpse into the worlds of female MMA fighters, brain injury and depression just to name a few. I found this to be a rewarding read that shines a new light on a very important topic that is rarely discussed. Girl Fighter by Cyan Night is a fictional story of strength, courage, and determination. The story centers around the main character, Aliyah, a mixed race female that lives a quiet and simple life as a computer specialist in London. Someone who has never struggled with learning or acquiring knowledge but there is something she carries from her childhood. A random passing of a martial arts gym piques her interest and the fire was ignited. Girl Fighter tells a story of strength because as a brain injury survivor, Aliyah does not give up and her endurance is evident and makes for an emotionally accurate read from author Cyan Night. I rate this story 4 stars and look forward to more from this talented author. Exciting book to read that will keep you reading one page after the next! I found this book at Amazon, watched the book video trailer and purchased it. There is something about Aliyah that keeps me turning one page to the next. Amidst the gender bullying and career pressures she commands herself on, I am enthralled at her perseverance to pursuing a passion in cage fighting whilst living a software engineer career in London. It's also saddening to know how an accident can suddenly change your life with people taking advantage of you after suffering from a brain injury to add with the violent, uncontrollable episodes you have to handle everyday. I felt sad and proud of her for braving everything. Her trials remind me of the challenges I go through in my life. I surely recommend this book to anyone.